[February 22, 2008] I'm dedicating this month's edition of Mutterings to the reconstruction of America's Gulf Coast region. Some of you may recall that when Hurricane Katrina hit the Gulf Coast in late August of 2005, I weighed in during my then-weekly Mutterings column in praise of the relief efforts. At the time, I believed that the news reports we were getting "up north" were true and accurate because of the obvious severe nature of the calamity. We knew that the area had been hit hard, but I don't think any of us had any idea just how widespread the devastation and destruction really was. The week the storm hit, I wrote a couple of checks to those on the front lines of the tragedy. However, I remarked to my wife at the time that sending money is not enough when a major disaster strikes. As an American, when something major happens, it affects all of us. I like to think that our positive response is one of the things that distinguishes us from many other countries in the world. Whether I am correct in that assessment or not, I will go to my grave thinking that Americans should help Americans when destruction has struck. Instead, sometimes the ugly, evil side of human nature turns up. It seems as if, from the start, lots of people were looking to blame the government or to wait and depend on the government for immediate and long-term help. I understand that for some types of help, that is all you can do. But it also appears to me that as Americans we have forgotten a few things. Foremost on that list is that we have forgotten that America is US. So blame the government if you think that will do any good -- and good luck with that. Or, you can continue to wait and depend on the government if you think that is the final answer. To me another thing on the list of forgotten things is that neighbors are supposed to help neighbors. So, to start directing this article toward a point, I spent the first two winters after the storm trying to get to the Gulf Coast. Isn't it incredible how many things can stand in the way of doing the right thing? Or at least trying to do something good? I try to live a life worthy of my calling, so I don't like to embarrass myself publicly unless it's for a good cause, but I'm embarrassed that I did not get to the Gulf Coast any sooner than I did. There is no adequate reason or excuse for it other than I simply dropped the ball. While it is a regret I will have to live with, I finally made it there last week, and the following is my report. It is merely a firsthand, eyewitness account of what I and a small group of "brothers" found on our rebuilding mission. We went down to help where we could and to scout out the situation to see if more volunteers were needed in the future. The following is the account of our experiences. Hurricane Katrina, a Category 5 hurricane, was formed on Aug. 23, 2005, and dissipated on Aug. 30, 2005. It made landfall on the Gulf Coast on Aug. 29, 2005. It was the third-strongest hurricane on record to ever make landfall in the United States. At least 1,836 deaths were attributed to Katrina, and subsequent floods and damage totals were over $81 billion dollars (Wikipedia). According to ABC News' Charles Gibson on a Katrina follow-up story that coincidentally aired last week while we were in the Gulf, 30,000 families totaling 100,000 people are still displaced today! It was in this setting that we thrust ourselves into the ongoing rebuilding project last week. One of the organizations that has long been close to my heart is Habitat for Humanity. Habitat for Humanity International was founded by Millard and Linda Fuller in 1976. Their vision was to establish an organization that would help to eliminate poverty housing and homelessness from the world and to make decent shelter a matter of conscience and action (those words "conscience" and "action" really stuck with me, and I never got them out of my mind). The Habitat organization has built more than 225,000 houses around the world that have provided 1 million people in more than 3,000 communities with safe, decent and affordable housing (www.habitat.org). 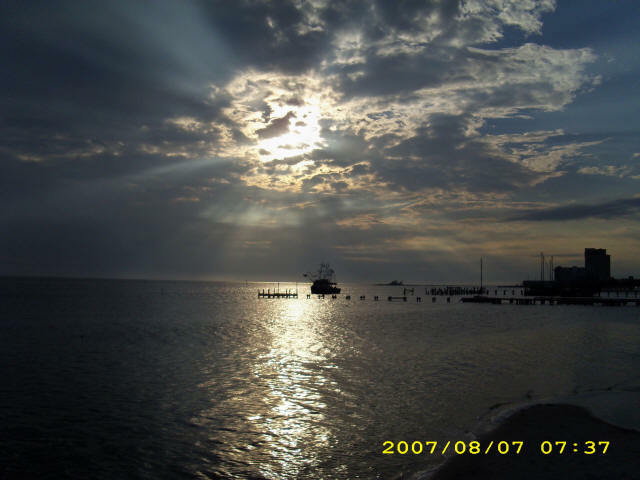 Why the Mississippi Gulf Coast? Good question. Many of the people in central Illinois who made me feel worse for not traveling south sooner were going to the New Orleans area. With over 50 percent of the storm's damage directed at that area, I can see why so many wanted to go help there. 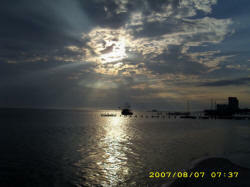 While I wanted to go and help there, my heart kept turning to the Mississippi Gulf Coast. Some of you know that my friend Craig Zastrow (a former Lincoln resident) and I travel to the NCAA Final Four together every year. One year when the finals were in the Superdome in New Orleans, we decided to stay in Biloxi, Miss. I can't speak for Craig, but that trip was one of the best Final Four memories I have ever had. The people were friendly, the food was awesome, and the golf was spectacular. So, when I saw that this storm had decimated the Biloxi area, I just wanted to go back and make a small return payment to a community that I felt so much for. As you can imagine, many relief organizations have been getting it done in the Mississippi Gulf Coast area since just days after the tragedy -- Habitat for Humanity chief among them. 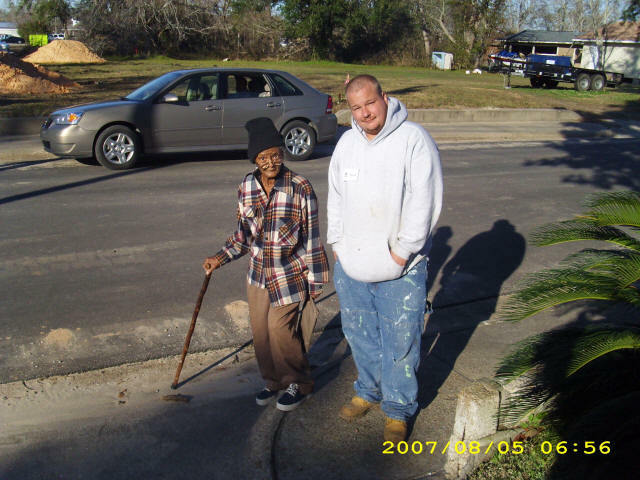 In fact, in a great display of unity, two counties -- Harrison and Jackson --merged to form the Habitat for Humanity of the Mississippi Gulf Coast in January of 2007. This group has amazingly completed or has under construction some 170 homes. Their plan is to build 800-1,000 homes by 2012 (www.hfhmgc.org). And with a mission or vision statement like "Building houses, building hope," how could you go wrong! So, since the Biloxi area had an outlet for service, it was a "no-brainer" for me to set up a trip to the Habitat for Humanity of the Mississippi Gulf Coast! With that in mind, I began to organize my plan. I told Melinda that this winter I just had to go there. She knew my heart and encouraged me to do so. I also told her that I was going even if I couldn't get anyone else to go with me. I began corresponding with the Habitat group and a lady by the name of Loren Moylan in the volunteer services office. Loren is extremely organized and a great encourager. 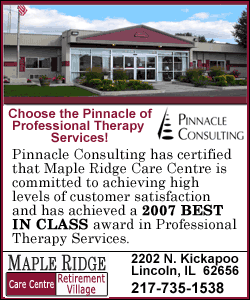 She is a consummate professional who dotted all the "i's" and crossed all the "t's." She made our trip planning so easy that even a dope like me could figure it all out. At first we had about 12 people in our group. Seven of them kept having the same obstacles cropping up that I had fielded the previous two winters. One guy's wife was due with a baby any day; another guy got a job promotion and didn't feel like the timing was good for him to get away; and on and on the hurdles came. When we loaded the van and headed for the Chicago O'Hare airport, there were five of us making the trip. As it turned out, a smaller group was much better logistically for this scouting operation. I have met lots of wonderful people during my 1 1/2 years in Beloit, Wis. Three of those gentlemen were coaxed into going on this adventure. Brian Cain and Jason Taylor, who are construction contractors with Cain-Banker Construction, and Mark Rand, who is an insurance agent with Alongi-Santos Insurance Agency, were willing to team with me on this endeavor. We were also joined by a gentleman who played college basketball for me in the middle '90s, Paul "Big Chief" Davis, who is a financial planner with Primerica. The five of us loaded the plane and headed for Gulfport, Miss., by way of Atlanta. All in all, we would be just five of over 500,000 volunteers who have worked in the Gulf Coast over the last 2 1/2 years (according to Gov. Barbour's report at www.governorbarbour.com/recovery). The report also states that some 5,320 homes were either built, rebuilt or renovated during this time. We were anxious to get there and do our small part to help. Where did we stay, where did we sleep and what did we eat? Again, good questions. Apparently somehow Habitat hooked up with the Salvation Army. In the early days right after the storm, someone had the idea of using Yankie Stadium, the old local high school football field, as a staging area. In those first few days they used the huge rooms under the massive sets of permanent bleacher seats as places to house and feed rescue workers and displaced local residents. As time went on, it became the place to house and feed Habitat and Salvation Army volunteers. They also added some bunkhouses, some porta-potties, etc. You pay $100 a week for this experience, and that includes your housing in the dorms and three delicious meals every day of your stay. You are responsible for traveling to and from your team's work site every day. You can stay in a hotel or your own RV if you have one and if that is your preference. A wonderful couple, Bill and Wanda Niles of Denver, Colo., were our gracious hosts (they may have a job opening for you as they may return home in late spring or early summer). You have all day on Monday to arrive at the Habitat Village, get checked in and move into your bunkhouse. At dinner you go through an orientation that is thorough and exhaustive. They answer all of your questions and some you would've never thought of. After supper you're on your own to explore the area. Former Lincoln man Paul Davis sticks the front porch floor decking in place in a new home going up in Pascagoula, Miss. On Tuesday morning, one person from each group or family reports to a meeting with work site foremen. Many of these people live in RVs or have volunteered to help Habitat for a minimum of two to six months. They divide all the volunteers up and send them to their respective work sites. Our group was paired up with Mike McDaniel, a human resources administrator from Chicago, and Glenn and Corrinne Vogel from Washington, Pa. We had an awesome group! They sent us to Pascagoula, Miss. (wouldn't Jimmy Buffet be proud of our Pascagoula Run? ), where they assigned us to work on homes that would be a part of this year's Jimmy Carter Project. Ardent news buffs might recall that the Carters got involved with the Habitat organization in around 1984, and the Gulf Coast homes will be their project this year. They plan to christen and dedicate these homes in May. One of the completed flooring systems that was our responsibility in Pascagoula, Miss. Our job was to install floor joists (man, are those things heavy), rat rails, trails, runs, metal strapping plates, etc. 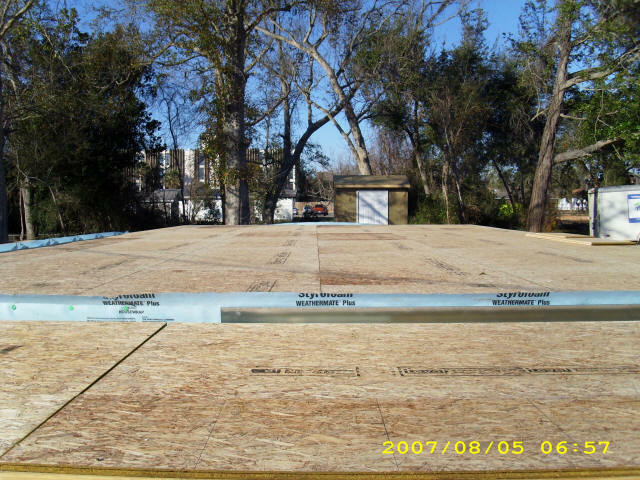 We were then to install subfloor decking, front porches and side porches. We were also asked to build outdoor sheds for the homes. The leaders there are meticulous about measurements being precise, and they want every build to culminate in a top-quality home (that is a good encouragement for all of us who have ever worked in the construction industry). We worked on four different home sites and helped ready the homes for this week's volunteers, who hopefully will begin erecting the walls of these fine structures. The teamwork and camaraderie on our work sites was a special experience for all of us. Many of us didn't know each other, and even the ones we did had never worked together on a project like this, in an environment like that. We also were blessed with outstanding leaders (foremen) on our work sites: Bob and Doris Meyer of Valrico, Fla; Bill Oates of Portage, Mich.; Mike Hosey of Ohio; and Jim Gourley of Maryland. They were leaders about as fine as you would ever hope to get. They not only put up with our nonsense, they were even willing to eat with us and be seen in public with us! At first, they weren't sure what to make of us. And if any of you loyal LDN readers know any of us, that is not hard for you to imagine. But after the first day, they even broke out the air hammers and the good tools so we could "get 'r done." Our team had pretty lofty goals. We didn't just want to be another group that went to the Gulf and helped with the rebuild. We wanted to set the bar high -- we wanted to get so much done and so much done accurately that it would motivate all future groups. Katrina victims who are displaced are not that excited about tourists who just want to come down and take pictures. They want workers to get their homes built so they can move in and get on with their lives. Some volunteers are leery of going up to the neighbors and just starting conversations with them. If you know me, you know that I know no strangers and will go up to about anyone. I was blessed by doing just that in Pascagoula. I met a 95-year-old lady named Hester who rode out the storm out because she had nowhere else to go. She told me that as the floodwaters went from her knees to her neck, she had forgotten that she hadn't been swimming in decades and was in no physical shape to do it now. Since it was late at night and some people in the neighborhood were asleep, she said she just began screaming. As she woke people up, they began helping each other, and somehow she made it through the night. However, she said it was beyond imaginable that they all made it through the first few weeks. 95-year-old Hester tells our Jason Taylor how she survived Hurricane Katrina. I introduced myself to the neighbor next door at one of our work sites, and his name was Harry. I immediately liked him because he was wearing a San Francisco 49ers hat. He served as our "unofficial supervisor" for the week. During our breaks I went to talk with him and he would ask me what we were doing, and I would attempt to tell him (I had no idea -- I just hammer when they tell me to hammer, saw what they tell me to saw, etc.). 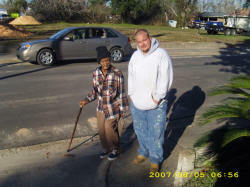 He told me that he, too, had ridden out the storm and that the floodwaters in his house were 3- to 4-feet high. 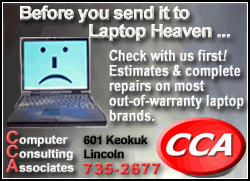 All of his carpets, floors and many precious heirlooms were lost. He did tell me that he and his neighbors were overwhelmed by the number of volunteers from all over the country who had come to his neighborhood to help. That made me smile. We met lots of other folks, but if I tell you about all of them, this will be a boxed set instead of just an article. I do have to tell you about Ali. She works for the Salvation Army and was in charge of serving our meals at night. As fate would have it, Ali lives in Pascagoula, so she was surprised that they sent us there to work (it is about 12-15 miles from Biloxi). She told us that many people have hurricane parties when the storms hit. They have been through so many tropical storms, huge rains and hurricanes before and survived them all, that they just assumed they'd survive this one as well. She was at a hurricane party when Katrina hit. But when the winds began to howl, the massive rains hit and the water began to rise, they knew they were in for a doozy! She then told us that when the water exploded through the wall outlets and everyone began screaming, they knew they were in for some big trouble. She said power was out for several days, and what was weird was not having much, if any, communication with the outside world. She is getting married later this year, and these experiences will likely help her in many ways. Regardless of what you may have read or heard on the news, the Gulf Coast people are fantastic. They are intelligent, they're savvy and they're resilient. They have been through a lot -- some of them having lost everything they had ever owned in the storm. They are not looking for handouts, and they are more than willing to work to rebuild their communities. We were proud and honored to give our small offering of work to their cause. I sure hope that if a major disaster ever hits Illinois or Wisconsin, that volunteers from around the country will come running to help us. The first thing that I discovered was how powerful the media really is. You will notice that throughout this piece I have included lots of footnotes, resources and supporting material. That is because I have a theory of my own. My theory is that the truth is much more powerful than any spin or fabrication. One thing I love about the Lincoln Daily News is that truth is never compromised or suppressed. We try to present the facts because we think our readers are very smart and can draw their own conclusions. I'm not running for office, so I don't care if you like me or not. I'm not even too concerned if you believe me or not. However, I will include some pictures of what we found and these supporting references so that you can read and see for yourself what the truth actually is. Two and a half years later there are still a lot of myths floating north and to all parts of our nation. One is that the rebuilding job has been completed. That simply is not true -- in fact, it is a horrible lie. Another myth is that our measly efforts in Pascagoula for one week can't possibly make any difference. Well, we probably didn't help every one of the 30,000 families that are still displaced, but we helped four of them. In just a few weeks or months they will move into beautiful new homes. That won't remove the nightmares and the bad memories that they will never get out of their minds, but they will have dry, secure and affordable homes to make a future in. I don't know about you, but I'm gonna be cheering for them! The Good Book says that "faith is being sure of what we hope for and certain of what we do not see" (Hebrews 11:1 NIV); and "let us hold unswervingly to the hope we profess, for he who promised is faithful. And let us consider how we may spur one another on toward love and good deeds" (Hebrews 10:23-24 NIV). I'm sure that many Americans had no hope for the Gulf Coast. I'm sure that many Mississippians who saw all their life's possessions floating away in the floodwaters saw whatever hope they had floating away on those storm surges. But hope remains. Hope is ever-present because the Creator is mindful of the people of the Gulf Coast. When there was no hope, volunteers and rescue workers handed out water, food and blankets. When there was no hope, an army of workers cleaned up the mess and hauled away the debris. 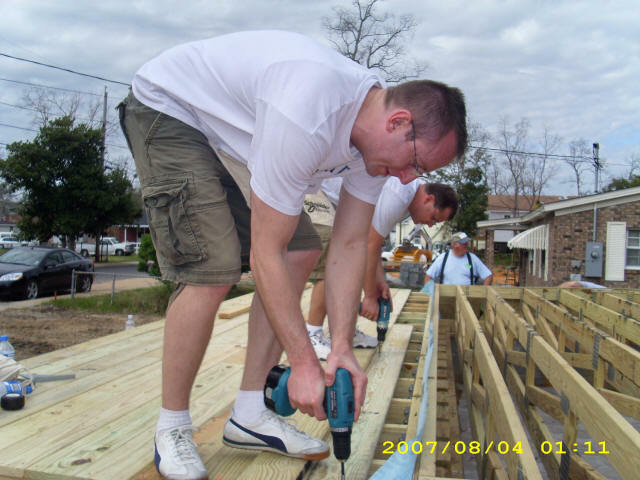 And when there was no hope, volunteers and construction workers came and rebuilt homes damaged by Katrina and built better new ones on the slabs of those homes that were swept away. What I learned is that HOPE is a dangerous thing and it is a wonderful thing. It may be the best of things. And the biggest thing that I learned is that HOPE is still being delivered to the wonderful people of the Mississippi Gulf Coast! I'm not much of an apologist. But if I haven't made a clear enough case as to why you and yours should go down and do your part to help, I have failed once again. On the other hand, if just one person who reads this goes and volunteers, then that is one less day the people there will have to wait to have their lives restored. Some people take their families down and work some while they're on vacation. Some gather a group of work colleagues and volunteer for a week. Others get their service organizations or clubs to organize a team of workers. Some churches send groups down throughout the year. 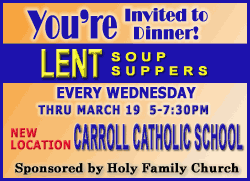 Whatever your motivation, whatever works for you, I implore you to go -- there is nothing better than delivering hope to a grateful brother or sister in need. There are probably dozens of organizations out there, but I will include four that I either worked with, saw in action or know could use both your dollars and your time. Together we can make our nation great again. Will you consider helping to deliver hope? I hope that you will. 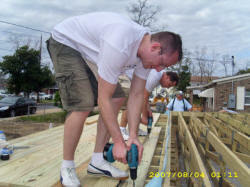 www.hfhmgc.org -- Habitat for Humanity of the Mississippi Gulf Coast, or you can e-mail them at volunteer@hfhmgc.org. You will probably get Loren, but anyone there can help you plan a trip of one week to several months or beyond. www.habitat-nola.org -- This is the Habitat organization in New Orleans. I don't know of their work personally, but I include this site as many people desire to work in this area and help the people who survived both the hurricane and the flood. Just click on the Katrina icon and you'll get the information. We worked with some volunteers from AmeriCorps while we were there. 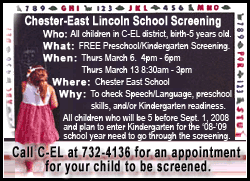 They have some great programs. Just surf around the site till you find what you're looking for. jeffmayfield@centralwired.com -- As you can tell by my writing, I'm certainly not an expert on this situation -- but, I do know enough to be dangerous. Seriously, I would be willing to serve as a trip organizer or information resource to any individual or group who would like to volunteer on a trip of this nature. Just e-mail me and outline your plans and submit your questions, and I'll do everything I can to get you the information you need to make a trip like this possible. This report is dedicated to the wonderful people of the Gulf Coast. Godspeed on your recovery and rebuilding efforts!